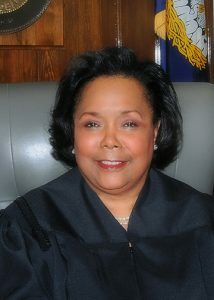 The Honorable Veronica E. Henry was elected to Section ‘C’ of the Orleans Parish First City Court in November, 2010. Her election to the bench followed a distinguished 26-year career practicing law in the City of New Orleans. Judge Henry is a 1975 honors graduate of St. Mary’s Academy in New Orleans and a 1978 Dean’s List graduate of the University of New Orleans, where she earned a Bachelor of Arts degree in Drama-Communications. Following college, Judge Henry pursued employment in broadcasting and enjoyed a successful tenure working in radio and television with the CBS and NBC affiliates in New Orleans. She worked initially as an on-air radio producer before moving to television public affairs programming, producing and on-air moderating. In 1981, while continuing to work in broadcasting, Judge Henry attended the evening division of Loyola University School of Law in New Orleans. In 1984, Judge Henry made the decision to devote herself full-time to her law studies and graduated from Loyola on August 31, 1984. In January 1985, Judge Henry began her legal career working as an Associate with the law firm of Jones, Nabonne and Wilkerson where her practice centered on personal injury and insurance defense, medical malpractice and energy regulatory litigation. In 1987, Judge Henry was made a partner and the law firm became known as Wilkerson & Henry, LLC. Judge Henry is a member of the Louisiana State Bar Association, New Orleans Bar Association, National Bar Association/Louisiana Judicial Council, Fourth and Fifth Circuit Judges Association, Louisiana City Judges Association, American Judges Association, National Association of Women Judges, A. P. Tureaud Inn of Court, New Orleans Bar Inn of Court, Louis A. Martinet Legal Society, and Association of Women Attorneys. Judge Henry is also a former hearing committee member of the Louisiana Attorney Disciplinary Board.